I haven't been very active here on mylot, time is my biggest enemy these days. I am going to post a few of my blogs that I have posted on my other sites. To my friends that have seen them, I hope you will forgive me, and I don't expect you to comment. To all my other friends I trust you will enjoy it. 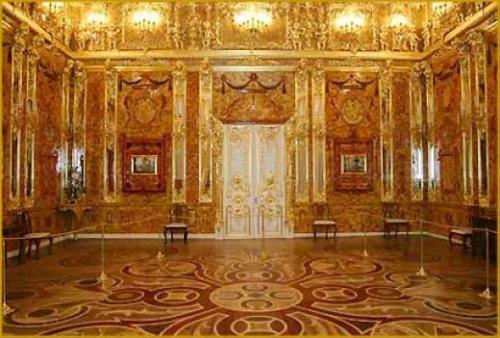 The magnificent Amber Room The magnificent Amber room in the summer Palace outside St Petersburg was one of the jewels in the crown of tsarist Russia. A British ambassador once described it as "the eighth wonder of the world". Twelve tonnes of rare amber went into the priceless panels that clothed its walls. Incredibly, this decorative marvel disappeared in the chaos of war in 1945 - and has never been found. The Amber room was originally commissioned by Frederick William I, King of Prussia, for his palace at Königsberg (now Kaliningrad) in 1701 n 1716, the king presented the room to Peter the Great of Russia as a gift to seal a military alliance between the two powers, and it was moved to the Winter Palace before being transferred to the Summer Palace by Peter's daughter Elizabeth in 1755. The room survived the upheaval of the Russian Revolution undamaged, but when the invading Nazi forces captured the Summer Palace during the Second World War, the room was transported back to Königsberg and reassembled there, apparently on the direct orders of Adolf Hitler. By the time Germany was overrun by the Allies in 1945, however, it had vanished. he Soviet authorities, determined to reclaim their national treasure, have been looking for the room ever since. So have a number of bounty hunters and art historians. At different times, clues have led investigators to a castle in Saxony, a Polish salt mine and a Baltic shipwreck. Even the US 9th Army has been suspected of the theft. But in every case, the trail has gone cold. Craftsmen in the Soviet Union have embarked on the heroic task of reconstructing the room exactly as it was. In 1979, the Soviet government initiated reconstruction of the room, allocating about $8 million. Germany's Ruhrgas, the biggest importer of Russian gas, joined the project in 1999 and donated $3.5 million, helping guarantee its completion. The culture minister, said the project had become,[quote]a symbol of German-Russian understanding and friendship. Russian President Vladimir Putin and German Chancellor Gerhard Schroeder opened the room to 47 fellow heads of state at St. Petersburg's 300th birthday bash, May 2003. In June 2003, it was unveiled to the public. Craftsmen in the Soviet Union have embarked on the heroic task of reconstructing the room exactly as it was. The legendary Amber Room made a dazzling reappearance in May, 2003 after an audacious, quarter-century reconstruction. President Vladimir Putin and German Chancellor Gerhard Schroeder opened the room to 47 fellow heads of state at St. Petersburg’ s 300th birthday bash at the end of May 2003. I remember your blog on this one. Great idea to use them. This is one of my favorites. I know..I say that a lot but then I like the next one and the next one and you know the rest. I love to read about such mysteries and this one is no exception...you are giving me ideas! Sorry to do this to you and all my other friends that supported all my other blogs,I am spreading myself to thin these days, and just don't find the time to do everything, especially with our trip to the UK on hand, sorting out our passports and visas are an absolute nightmare in my country. But I will send you a private message at you know where., then you will see the method behind my madness. You are going to UK to see Michelle! That is so awesome! I cannot wait to hear all the details. This is one aspect of history that I am not familiar with. I count myself lucky to have visited a museum exhibit of the Treasures of the Tsars, but there is much of Russian History that I do not know. I am very appreciative of the fact that Russia and Germany have worked together on this artistic and historical restoration of this room. I still run around with the image in my mind of Russia as the USSR, a cold and militaristic state, and I do not reconcile it with the rich artistic and literary heritage of the diverse people of that region. I have mixed emotions about them as well it is almost if they are two different countries in one sharing a history that doesn't add up to the image, I have in my mind.